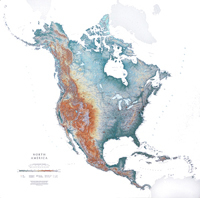 From the Aleutian Islands to the Lesser Antilles, the Raven North America map is remarkable in its detail. The map displays glaciers, mountain ranges, rivers and lakes, as well as urban areas, important roads, and railroads. Elevations are represented by color, and this, in combination with Raven's relief shading technique, gives the map a 3-dimensional look. 42" x 43"